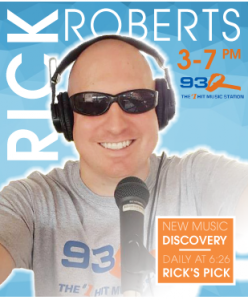 Listen to Rick’s Pick, weekdays at 6:26! Rick plays a potential hit song during your drive home! When I’m not working one of my 10 hour days at 93Q, I’m home spending time with my family. I have two kids, a girl and a boy. Kylie is 10 and Caden is 6. Kylie loves horseback riding, animals, making slime, swimming, basketball, dancing, and more. Caden loves Minecraft, soccer, bike riding, nerf guns, drones, and always wants to be outdoors. My wife Katie (been married 12 years now!) works full time at Le Moyne College in the Registrar’s office and absolutely loves her job as much as I love mine. I’m actually working at Le Moyne now too as the faculty advisor for their campus radio station – WLMU. You can hear it on the Live365 app or online. I can’t forget our pets! We have a beagle hound mix rescue named Abby who is the most gentle (and lazy!) dog you’ll ever meet. She also snores like a grown man. We also have a rescue chug (chihuahua & pug) named Skye who loves to kiss and play. She does a good job of keeping Abby entertained and feeling young. Oh….and we also have two fish. We, like most families, are constantly busy with everything going on in our lives. I am a lucky man to have such a great family life. I am an avid SYRACUSE ORANGE basketball fan, and just a big fan of basketball in general! I run a league on Sunday mornings and I also play in a league on Wednesday nights. I love watching stupid videos on the Internet. Pizza is my favorite food, and I would eat it every day if my wife would let me. I also love chicken! A lot. I am one of eight brothers and sisters, and I am the third oldest. Almost all of my siblings live away from CNY, and I miss them terribly! I have been full time on 93Q since I was a senior in high school (Liverpool – class of 2000), doing the night show from September of 1999 till June of 2006. I was then promoted to Assistant Program Director/Music Director and to the afternoon shift. In addition to being on air Monday-Friday 3-7pm, and Saturday 1-5pm, I am also 93Q’s Music Director, which means I am in charge of scheduling all the music you hear on 93Q! I’m also 93Q’s Assistant Program Director, working closely with our Program Director Tom Mitchell with all aspects of 93Q. Your comments and feedback are always welcome! And last but not least I’m 93Q’s Digital Content Manager – managing this website, 93Q.com and all of our social media channels. Email me Rick@93Q.com or call me 315-421-9393! Reach out via social media as well!